What are the Advantages of Faux Wood Window Shutters? A lot of homeowners associate window shutters in Coral Springs, FL with exterior applications, particularly because of the need for hurricane shutters. But some window shutters can also be installed inside. They look great, provide privacy, help control light, and insulate your windows. Interior window shutters come in a variety of materials, but faux wood shutters are becoming more popular. These window treatments are made from a blend of vinyl and real wood. Most window treatments have been designed for simple installation. But installing faux wood shutters is easier than ever. Faux wood shutters feature a hollow-bodied construction, making them lightweight and easy to lift and hang. As long as you take accurate measurements the installation should be quick and simple. Real wood shutters require special care and treatment when it is time for cleaning. With faux wood shutters, you can wipe them clean with mild detergent and water, or take them outside and give them a quick rinse. Without proper sealing wood blinds can swell, rot, and mold when exposed to moisture. It can be a major disadvantage. Excessive heat or UV rays can damage real wood. But with faux wood shutters, you don’t have to be concerned about water or sunlight because they have a higher level of resistance to moisture and heat. Because these window treatments are resistant to heat and moisture they stay in better shape and can last a long time. The composite materials in the core of these shutters make these window coverings resistant to warping, bending, and breaking. They don’t need any special processes of maintenance. Real wood shutters are vulnerable to dents, dings, scratches, and fading. After a few years, they may start to show signs of wear and tear, and they are not always easy to refinish. But faux wood windows are naturally resistant to scratches and fading. They look new for so much longer. Most people like the look of real wood, but not the price tag. 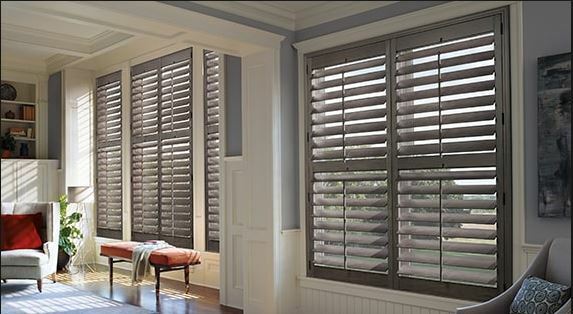 Real wood window shutters are some of the most expensive window treatments on the market. But with faux wood, you can get close to the same aesthetic at a more affordable price. Faux wood shutters are mostly made of PVC. It is a highly versatile, highly recyclable material. With these shutters, you can reduce the waste that goes to the landfill. You can also make an eco-friendly decision by choosing to purchase shutters made from recycled materials. If you are thinking about getting faux wood window shutters in Coral Springs, FL contact Open House Interiors at (954) 533-7445. We can give you detailed information about modern window treatments and help you find customized options to suit your needs. We not only have faux wood shutters, but also blinds, shades, drapes, and curtains. You can schedule an appointment to stop by 4312 North Federal Hwy., Fort Lauderdale, FL 33308 for a consultation that is convenient for you.